This tutorial shows everything you need to do to enable your App Engine Go app to access Cloud Storage. This non-interactive sample shows you how to create, write, read, and list files in a Cloud Storage bucket. When this sample runs, it executes a script that performs several actions against your Cloud Storage bucket and then outputs details to your browser. Deploy and run the sample app in Google App Engine. Learn how to create a file and then write that file to a Cloud Storage bucket. Learn how to read files from a Cloud Storage bucket. Learn how to copy files in a Cloud Storage bucket. Learn how to list the files that exist in a Cloud Storage. App Engine has a free level of usage. If your total usage of App Engine is less than the limits specified in the App Engine free quota, there is no charge for doing this tutorial. Downloaded and install the SDK for App Engine. Activate the default Cloud Storage bucket. Download and install the Cloud Storage Client Library. 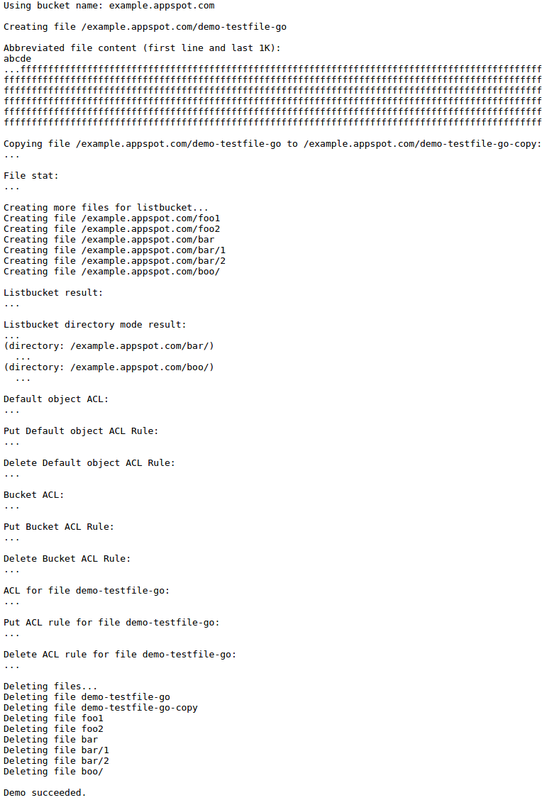 Download the sample as a .zip file and then extract it to your working directory. To learn more about deploying your app from the command line, see Deploying a Go App. Review the app results. Your browser should display details for each of the actions that the script performed on your Cloud Storage bucket. In addition to writing, reading, coping, and listing files, the sample app also displays object permissions, manipulates access control lists (ACLs), and then cleans up by deleted all the demo files from your Cloud Storage bucket. This walkthrough only covers how to read and write to a Cloud Storage bucket, and list the bucket contents, even though the sample code contains additional Cloud Storage functionality. For more information on configuration options available in this file, see the app.yaml reference. Specify access to a file in your Cloud Storage bucket that is different from the defaults. See x-goog-acl for more information. The Cloud Storage client library function reference. Read the Error Handling reference.